Immigration and Customs Enforcement officer. Image via US-ICE/Flickr. Public domain. USA Today reports that while the Trump administration has ramped up raids on businesses using illegal labor, federal authorities have used their power to punish workers rather than exploitative employers. According to USA Today, the U.S. Immigration and Customs Enforcement agency was ordered to quadruple worksite enforcement in 2018. Throughout the fiscal year, which ended on September 30th, ICE set ’10-year highs for the number of workplace audits conducted’ and criminal charges filed. ICE says its cracking down on employers just the same as it is immigrants. But USA Today claims the data belies a different truth. While more managers than ever have been detained for hiring undocumented workers, nearly six times as many illegal immigrants have been arrested on job sites across the nation. That discrepancy could be explained as a matter of proportions and ratios. However, USA Today’s analysis shows that the percentage increases in arrests are drastically different. The 113 ‘members of management’ charged with criminal, migration-related violations in 2018 represent an 82 percent increase from last fiscal year. But the 666 workers charged with criminal violations pose an almost 1,000 percent increase. Under the Trump administration, arrests of immigrants without criminal histories are at a recent high. Image via U.S. Immigration and Customs Enforcement agency/Wikimedia Commons. Public domain. Administrative arrests—those for basic immigration violations without a criminal element—are up by nearly 200 percent, too. Greg Nevano, who oversees worksite enforcement for ICE’s Homeland Security Investigations office, told USA Today that the numbers don’t mean employees are getting a free pass. Instead, Nevano explains the disparity by way of slow-moving bureaucracy: it takes longer for charges to get finalized against employers, because their cases tend to be more complex. “We will need time to develop these investigations,” Nevano said. But immigration advocates say they’re skeptical of the Trump administration and its intent, especially when they consider its track record on similar issues. “When you look at the deployment of prosecutorial resources by the Departments of Justice and Homeland Security, it’s clear they are more worried about the undocumented housekeeper than they are about the unscrupulous employer,” said Ali Noorani of the National Immigration Forum. Different presidential administrations have had different priorities. USA Today says that under George W. Bush, enforcement emphases were mostly upon rounding up and deporting workers. 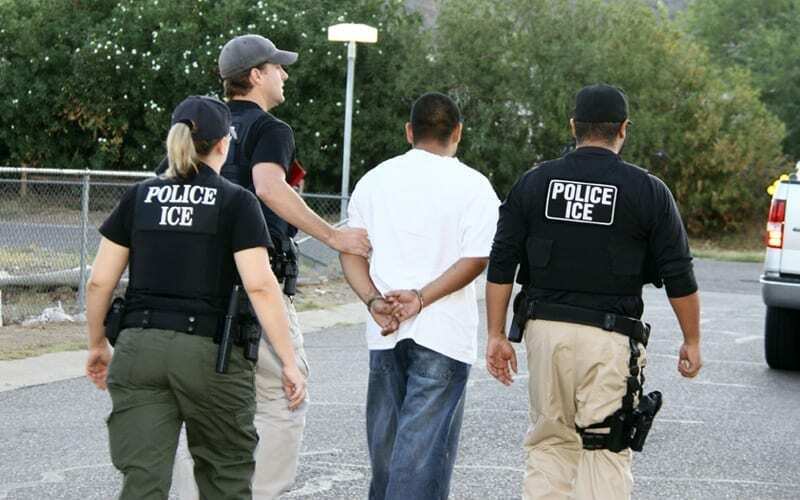 After President Barack Obama took office, ICE began initiating more audits against employers. Trump’s supporters might say the current president is just doing a better job: ICE is being instructed to focus on violations at the management and labor level. Thomas Homan—who was Trump’s director of ICE last year—told the Heritage Foundation in a speech that the agency’s attempting to boost workplace enforcement by “four or five times” its previous levels. The goal, says ICE’s current head of Homeland Security Investigations, is reducing cartel-related crime and immigration rates by depriving would-be aliens the opportunity to find gainful employment within the United States. Homeland Security Investigation chief Derek Benner says there seems to be a belief that businesses hiring illegal immigrants won’t have their hiring records diligently checked. He hopes recently implemented strategy will make employers fear an ICE audit as much as they might one from the IRS.